Release of PlayOnLinux 5.0 alpha 1 - PlayOnMac - Run your Windows applications on Mac easily! I'm aware that it has been a while since the last time we gave news to you. Be reassured, the project is moving on and here we are to give you some news. Today, I am very proud to announce that we have managed to release the alpha version of PlayOnLinux and PlayOnMac 5 (aka Phoenicis). I would like to give my special thanks to those who have continued the work I started few years ago: @plata and @madoar, and many others. The platform is decentralized, meaning that the program will continue working if our website encounters problems. We have chosen to store the scripts on a git repository (https://github.com/PhoenicisOrg/scripts) so that it becomes more respectful of open source principles. We need to go further and find a way to gather your feedback. 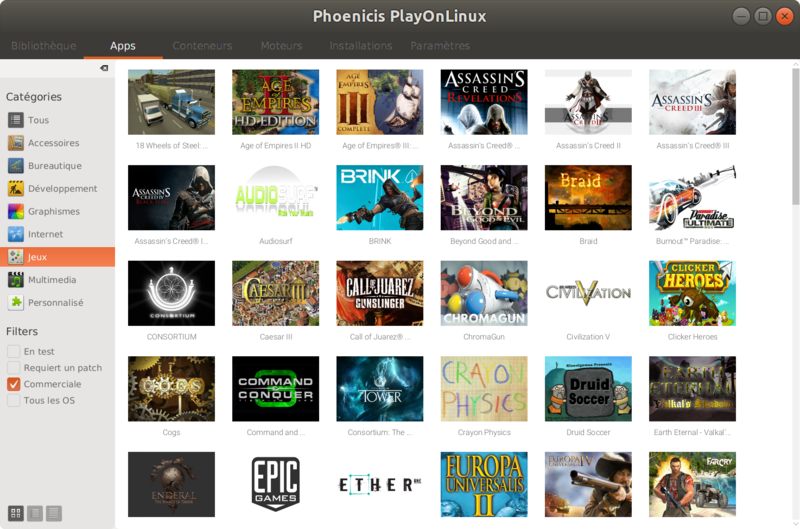 This is the reason why we are releasing an alpha-test version of Phoencis. If you want to add / update a script, you can check this repository: https://github.com/PhoenicisOrg/scripts. If you need, you can even create your own script repository. The project is far from being finished. Our next steps are to develop a strong Wine build platform using modern virtualization and/or containerization solutions. Then, we will make a new website (hosted at: http://www.phoenicis.org) so that we can continue giving you the best support we can.